Hey there, Camper! You made it past the gate, which means you are pure of heart and ready to have a RIDICULOUSLY AWESOME time at Camp Nerd Fitness! We have a little project for you to complete while you’re counting down the days until we’ll all be together. Don’t worry – it’s easy, and it shouldn’t take more than 10 minutes. Below you’ll see four sections of information we need to collect from you. We’ll use this info throughout the year to help craft your Camp experience to ensure it’s the best ever. There are a couple fields that are required, but we’d love you forever if you filled out every section completely. Just click the arrow to the right of the section header to view each grouping and hit the “Update My Profile” button at the bottom when you’re finished! If you ever need to make edits, you can visit this page any time to update your information! Not you? E-mail us at Camp@nerdfitness.com and we'll get it figured out. What do you prefer to go by? Juuuuust to be safe: if you are one of our awesome international campers, please enter your complete shipping address here. This will help us make sure a potential shipment reaches you in case our export decides to be moody one day. Do you have any requested roommates/bunkmates? In general, do you wake up early or stay up late? We will do our best to accommodate when matching up your bunkmates. If you are in a group bunk, do you prefer co-ed or same gender? Which Guild(s) are you a member of? Do you have any allergies or medical concerns we should know about? Do you have any movement restrictions or limitations? What are you looking most forward to at Camp? Interested in upgrading to a different room type? Have a request or suggestion? Just want to say hi? Now’s your chance! Give each of these descriptions a read and then rank them in order 1 through 4, 1 being “most like me” and 4 being “least like me.” Please use each ranking only once. If more than one strongly resonates with you, just do your best to rank them. There are no right or wrong answers! Remember to use each ranking only once. E.g. if you select 2 for this option, you can't use 2 again. Because of our strict cancellation policy, we highly recommend travel insurance. I have read and understand the Camp cancellation policy. All campers are required to sign a waiver before taking part in any activities at Camp. Instead of having you sign on site, we’re taking care of it now! Please read the full waiver terms below and sign in the box to accept the agreement. If you’d like to download a copy to save, you can do so here. This contract (“Contract”) is made and entered into by and among you, the undersigned individual (“You”) on the one hand, and the Kaplan Mitchell Retreat & Conference Center at Ramah Darom (“Kaplan Mitchell”) and Level Up Enterprises, Inc. d/b/a Nerd Fitness (“Nerd Fitness”) on the other hand. This Contract shall be effective as of the date you sign the Contract (the “Effective Date”). THIS CONTRACT CONTAINS IMPORTANT LIMITATIONS ON YOUR RIGHTS AND CONSTITUTES A LEGALLY BINDING CONTRACT BETWEEN YOU AND Kaplan Mitchell AND BETWEEN YOU AND Nerd Fitness. PLEASE READ ALL OF THE TERMS OF THIS CONTRACT CAREFULLY. All references to “Nerd Fitness” shall be understood to include Level Up Enterprises, Inc. d/b/a Nerd Fitness, and any person or entity wholly owned by or working for Nerd Fitness or affiliated through ownership with the owners of Nerd Fitness. All references to “Kaplan Mitchell” shall be understood to mean The Kaplan Mitchell Retreat & Conference Center at Ramah Darom, and any person or entity wholly owned by or working for The Kaplan Mitchell Retreat & Conference Center at Ramah Darom or affiliated through ownership with the owners of The Kaplan Mitchell Retreat & Conference Center at Ramah Darom. All references to “Camp Nerd Fitness” or “Camp” shall refer to the event located at The Kaplan Mitchell Retreat & Conference Center at Ramah Darom featuring multiple seminars, classes, events, group exercise, and fitness/lifestyle coaching. All references to a “Camper” or “Campers” shall be understood to include You, as well as all other guests of the Camp, and shall include each person, other than Nerd Fitness personnel, Kaplan Mitchell personnel, speakers and/or instructors, who register for the Camp or attends any Camp or Camp-related event. All terms shall be considered gender neutral and pronouns shall refer to the masculine and feminine, as context requires. The following terms and conditions are incorporated in and made a part of the Contract between each Camper and Nerd Fitness and Kaplan Mitchell. Camp Nerd Fitness is an event featuring multiple seminars, classes, events, group exercise, and fitness/lifestyle coaching. Nothing contained herein is intended to be, nor shall it be construed as, an absolute right or guarantee to specifically attend any particular seminar, group exercise or coaching session, class or event on any particular date, or that such seminar, exercise or coaching session, class or event will be performed, instructed or led by any particular speaker, performer or instructor. Camper agrees that Camper is purchasing attendance at the Camp for a specific period of time during which it is anticipated that certain instructors and other special guests will perform at multiple events during the Camp, which times will be announced prior to Camp and/or during the Camp. While every effort is made by Nerd Fitness to avoid conflicting events and performances, Nerd Fitness cannot guarantee that any Camper will be able to attend every performance, event, seminar, exercise session, presentation and/or class at the Camp. It is also anticipated that individual artists, performers and/or instructors may attend events during the Camp to provide Campers an opportunity to meet the artists or performers in person. However, Nerd Fitness cannot guarantee that any Camper will in fact be able to meet any of the performers, instructors or artists in person during the Camp. By attending Camp and/or any Camp-related events, each Camper, acknowledges that he or she voluntarily desires to participate in certain physical exercise, training and related sports and physical activities that require physical exertion (the “Activities”) in connection with Camp Nerd Fitness. Camper expressly accepts the terms and conditions contained in this Contract as a condition to participating in the Activities at Camp Nerd Fitness for himself or herself, as well as for his or her respective executors, administrators, heirs, next of kin, successors, and assigns. Camper further acknowledges that Camper’s acceptance of the terms and conditions of this Contract shall directly inure to the benefit of Nerd Fitness, Kaplan Mitchell, and their respective directors, officers, employees, owners, agents, attorneys, contractors and representatives (each, an “Indemnified Party”). By acceptance of this Contract, Camper assumes all of the risks of participating in any and all of the activities offered at the Camp, including without limitation, any risks that may arise from (i) the negligence or carelessness on the part of the Indemnified Parties; (ii) dangerous or defective equipment or property owned, maintained, or controlled by the Indemnified Parties. Camper certifies that he/she is sufficiently physically fit, sufficiently equipped for, and has sufficiently prepared or trained for the Activities and have NOT been advised by any healthcare professional or otherwise not to participate in the Activities, and that that there are no health-related reasons or problems which would or should preclude his or her participation in the Activities. Camper hereby agrees to indemnify, defend and hold harmless the Indemnified Parties from and against any and all liability, including but not limited to, liability arising from the negligence or fault of the Indemnified Parties, including death, disability, personal injury or property damage, as the result of his or her participation in the Activities, or his or her attendance at the Camp. Further, in consideration for my participation in the Camp I, on behalf of myself, my representatives, heirs, attorneys, successors and assigns, do herewith release, quitclaim, waive and forever relinquish any and all claims, actions, causes of action and accounts that I or they may have, or claim to have, or had, or claimed to have, or may have, or may claim to have in the future against Nerd Fitness and Kaplan Mitchell, as well as its employees, officers, directors, shareholders, members, managers, parents, affiliates, subsidiaries, agents, representatives, attorneys, successors and assigns arising out of, or connected with, my participation in the Camp, or otherwise arising out of any activity associated therewith. In furtherance of the foregoing, Camper further covenants and agrees not to sue or make any other claim against any of the Indemnified Party for any claim or liability caused by or arising out of Camper’s participation in the Activities. Camper certifies that he or she is at least sixteen (16) years of age. If Camper is at least sixteen (16) but younger than eighteen (18), Camper certifies that he or she is accompanied by a parent or legal guardian who is aware and has given full consent for them to participate in the activities of the Camp, as signified by such parent or legal guardian’s signature below, and as further governed by the requirements in Section 4 below. Camper hereby consents to receive medical treatment that which may be deemed advisable by Nerd Fitness or Kaplan Mitchell in the event of injury, accident, and/or illness during participation in the Camp activities in the event that the Camper is unable to provide the required consent at the time. BY ACCEPTING THIS CONTRACT, CAMPER CERTIFIES THAT HE OR SHE HAS READ THIS DOCUMENT CAREFULLY AND FULLY UNDERSTANDS ITS CONTENTS. CAMPER IS AWARE THAT THIS CONTRACT CONTAINS, AMONG OTHER THINGS, A FULL RELEASE AND WAIVER OF LIABILITY AND ACCEPTS SUCH WAIVER AND RELEASE OUT OF THEIR OWN FREE WILL. Campers must be 16 years of age or older on date Camp begins, and Campers 16 & 17 years of age must be accompanied by an adult over the age of 25 booked in the same cabin/hotel room, OR if a parent or legal guardian is in an adjacent room/cabin. Ages will be verified at check in and any Camper who does not meet the age requirements will be denied the right to attend Camp and no refunds will be made. Campers who suffer from disabilities or who have special needs, and any such persons who may become Campers are hereby advised that (i) terrain and rustic living arrangements may cause difficulty for mobility impaired persons or persons with severely impaired sight and/or hearing, (ii) for reasons of Camper safety and well-being, persons who are unable to care for their basic needs (e.g. dressing, eating and attending safety drills) must have a capable traveling adult companion who will be required to share accommodations with such person, (iii) certain accommodations may not be fully accessible to wheelchairs or scooters and some Campers with limited mobility may find it difficult to enter and exit the accommodations, and (iv) certain recreational activities may not be fully accessible to Campers with disabilities. Any disabled or special needs persons requiring special medical, physical or other requirements including whether such persons intend to bring a scooter, wheelchair or other device to assist with mobility, must be reported to Kaplan Mitchell and Nerd Fitness when reservations for any Camper with such disability or special needs are requested. It is understood and agreed that pregnancy shall be regarded as a physical disability and application for lodging from an expectant mother must be accompanied by a medical certificate establishing her fitness for travel and participation in the activities and classes offered at Camp. Kaplan Mitchell and Nerd Fitness reserve the right to refuse accommodations and/or class attendance to anyone, including women in advanced stages of pregnancy, who is, in the sole judgment of Kaplan Mitchell and Nerd Fitness, in such physical or mental condition as to be unfit for travel or who may require care and attention beyond that which Kaplan Mitchell and Nerd Fitness can provide. This Contract is governed by the laws of the state of Georgia. It is agreed by and between each Camper and NERD FITNESS and KAPLAN MITCHELL that all disputes and matters whatsoever arising under, in connection with or incident to this agreement or to CAMP NERD FITNESS including any dispute or matter arising out of or related to Camper’s travel to the Camp, shall be settled by arbitration administered by the American Arbitration Association in Atlanta, Georgia, in accordance with its Commercial Arbitration Rules and judgment on the award rendered by the arbitrator(s) may be entered in any court having jurisdiction thereof. This Contract is not transferable and you may not sell or assign it. This Contract may not be modified except in writing signed by Nerd Fitness and Kaplan Mitchell. The terms, conditions and limitations herein shall apply to any and all disputes between you and Nerd Fitness and Kaplan Mitchell, whether arising at the Camp or in any other place, location or any mode of transportation whatsoever. All rights, defenses, disclaimers and limitations of liability set forth herein shall inure to the benefit of Nerd Fitness and Kaplan Mitchell, and all concessionaires, independent contractors or other providers of any services or facilities in connection with or incident to the Camper’s experience while attending Camp, as well as any of their respective affiliated or related companies, parents, subsidiaries, successors, assigns or fictitiously named entities; and all suppliers, component part manufacturers; and the owners, operators, members, directors, managers, agents, employees, and representatives of each of the foregoing. Neither Nerd Fitness nor Kaplan Mitchell, nor any of their employees have any authority to change, modify, alter or suspend any of the provisions of the Contract between the Camper and Nerd Fitness and Kaplan Mitchell, and the terms of this Contract shall govern the relationship between Camper, Nerd Fitness and Kaplan Mitchell exclusively. I agree that Nerd Fitness may tape and photograph me, and record my voice, likeness, and sounds during and in connection with the Camp and that Nerd Fitness shall be the exclusive owner of the results and proceeds of such taping, photography, and recording with the right, throughout the world, to copyright, to use, reproduce, distribute, perform, display, to create derivative works thereof, and to license others to use, in any manner, and in any media now known or hereinafter invented, including electronic media, all or any portion thereof or a reproduction thereof in connection with the Camp or otherwise an unlimited number of times in perpetuity. I hereby waive any claim I may have under any theory of natural rights, including Droit Morale, or any right of attribution under the copyright law of any jurisdiction with respect to these rights, to the extent such waiver is recognizable under the law of such jurisdiction. I further agree that Nerd Fitness may use and license others to use my name, voice, likeness and any biographical material concerning me which I may provide, throughout the world in all media, including electronic media, an unlimited number of times and in perpetuity in connection with the advertising and/or promotion of the Camp or otherwise as Nerd Fitness deems reasonable and appropriate and in connection with the promotion, advertising, sale, publicizing and exploitation of the Camp and/or otherwise (and Nerd Fitness’s ancillary products or services in connection with the Camp) and in connection with Nerd Fitness or its affiliated goods and/or services. I further represent that any statements made by me during the Camp are true, to the best of my knowledge, and that neither they nor my appearance in media in connection with the Camp will violate or infringe the rights of any third party. I hereby waive any right of inspection or approval of materials produced in connection with the Camp or my appearance, name, voice, likeness and/or any biographical material concerning me or the uses to which such appearance, name, voice, likeness and/or any biographical material concerning me may be put. I acknowledge that Nerd Fitness is not required to use any aspect of my appearance in connection with the Camp, and that Nerd Fitness will rely on this permission potentially at substantial cost, and hereby agree not to assert any claim of any nature whatsoever against anyone relating to the exercise of the permissions granted hereunder. I agree to the terms and conditions of this contract and certify I am over the age of 18, or that I am the legal guardian or parent of a camper who is under 18. The deadline to purchase shuttles and premium activities has passed. To inquire about your tickets, please email us at camp@nerdfitness.com. 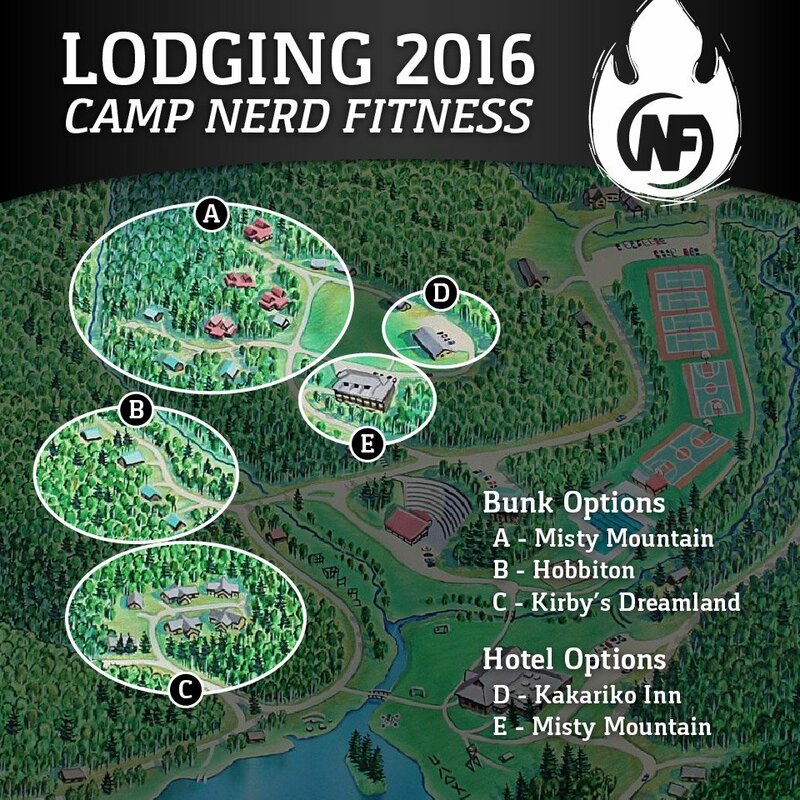 To make edits or cancellations to any premium activity or shuttle purchases, please email us at camp@nerdfitness.com with the information. No refunds will be issued after August 12, 2016. If you purchased an inbound shuttle ticket please provide the arrival time and flight number. If you purchased an outbound shuttle ticket please provide the departure time and flight number. If you purchased the Climbing Wall, are there any campers you want to be grouped with? We will do our best to make it happen! If you purchased the Ropes Course, are there any campers you want to be grouped with? We will do our best to make it happen!